Get great tasting, healthy water for just pennies per gallon! -- Enviro Products’ patented 10 Stage Water Filter delivers chlorine-free, odorless, great-tasting water at your kitchen sink. The space-saving, attractive countertop filter installs easily in seconds to any standard faucet and allows you to easily change between tap water and filtered water as needed. Stage 4 - 30 cubic inches of ultra fine mesh, superior coconut shell and granulated activated carbon. Granulated activated carbon has long been accepted by the E.P.A. and others as the premier, cost-effective way to remove chlorine, bad odors and color from drinking water. G.A.C. also removes organic contaminants such as pesticides, herbicides, arsenic, mercury and trihalomethanes - a cancer-causing organic pollutant. 365 DAYS OF FANTASTIC, FRESH WATER FOR YOU AND YOUR FAMILY! 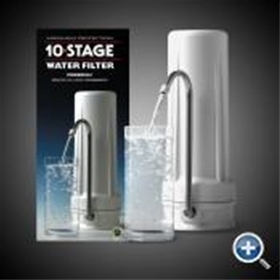 The 10 Stage Water Filter has a replaceable filter cartridge that will last a family of 4 an entire year! This is approximately 1500 gallons of water. Enviro Products also offers a FREE cartridge change reminder service. Simply send in your warranty card or call us at 800-592-8371 to register your filter or update your filter change information.